Gardiner High students and chaperones learned the famed cathedral was burning over dinner in Paris on Monday. On a whim, Amber Dostie and the group of Gardiner Area High School students she’s traveling with trekked to the Cathedral of Notre Dame in Paris Sunday. 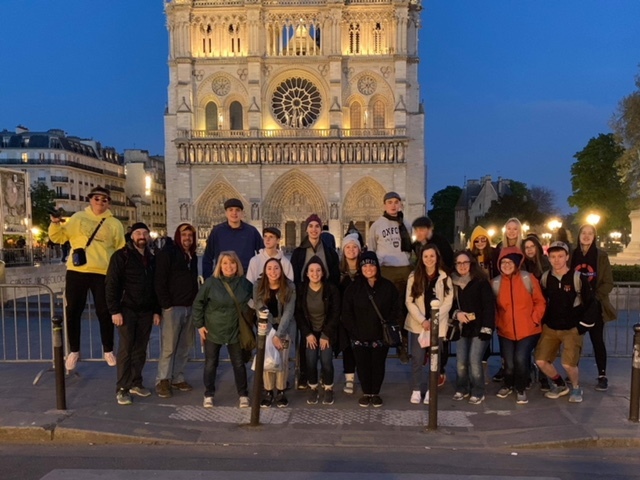 The world famous cathedral wasn’t on their scheduled tour, Dostie — a history teacher and the chairwoman of the Social Studies Department at the high school — said from her Paris hotel room late Monday, although their tour does include a nighttime river cruise that was scheduled to go past the cathedral Tuesday evening. As it is, that group of students from Kennebec County will be among the last groups to see the iconic cathedral as it was before fire broke out Monday, destroying the spire and seriously damaging the structure that has been standing for eight centuries. Dostie is in Europe this week with a group of 28 students and 15 adults, touring in and around Paris before traveling to Barcelona later this week. They were unaware that anything was happening until their waiter announced it at dinner. If the waiter hadn’t said anything, Dostie said, they would have gone out for ice cream and churros before returning to the hotel. As it was, she said, a group of students returned directly to the hotel, while a few stayed out long enough to get their planned post-dinner treat before returning to the hotel to let parents and school administrators in Maine know that all is well with the travelers. Gardiner Area High School Principal Chad Kempton said Dostie had posted a message on Facebook that everyone was safe, and she had sent him a message as well, just as he was looking at the news of the fire. “We have a big group out there right now, like 40-something people, and they are having a historic adventure,” Kempton said. 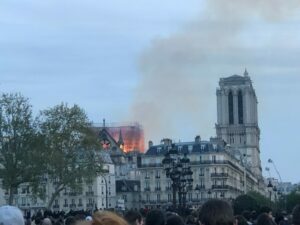 Dostie, who has been to Paris before and has toured the cathedral, went back out with her husband to see the fire as did thousands of other people. She took photos and recorded video. For a crowd as big as the one gathered, Dostie said, they were quiet and subdued. The last time she was in Paris was at Easter time, she said. Masses still take place at the cathedral, and it’s destruction from the fire will be quite a loss to the people in the French city. She had heard from one of her college professors that a lot of the art work had been removed from the stone and wood cathedral, probably because of the renovations. 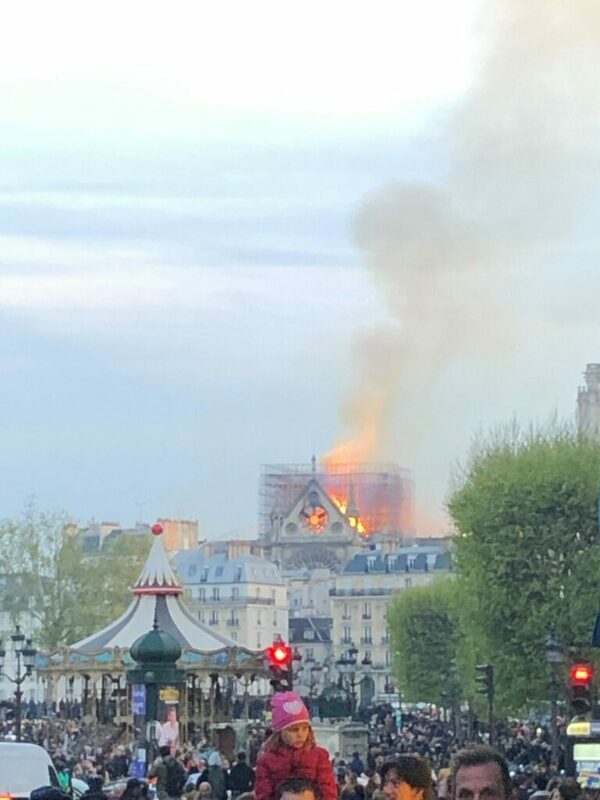 Fire trucks were using hoses and water cannons to dump water on the structure, and in an attempt to save one of the stained glass windows. “Clearly, it’s a massive structure, and I cannot imagine it did a lot,” Dostie said.